Marmitako with “bonito” fish, it is another of the essentials of the seafood cuisine of the Euskadi coasts. A boat stew, simple but full of flavor. “Bonito” fish from the port of Hondarribia of 6 or 8 kilos, potato and vegetables. Simplicity, tradition and seasonal products, the gastronomy from the origins of SAGARDI. The “Bonito” fish that we serve in our restaurants comes from a traditional fishing tradition, one by one, from the boat Itsas Lagunak (Friends of the Sea), which provides us each season with the best “Bonito del Norte” of the Basque Country. The “arrantzales” (fishermen) of Itsas Lagunak use hook fishing so that the fish does not suffer and offers higher quality meat, in an artisanal and sustainable way. The Itsas lagunak, with its 33.5 m. length and modern technology is one of the flagship of the inshore fleet, the best ally to get a unique product for our restaurants. 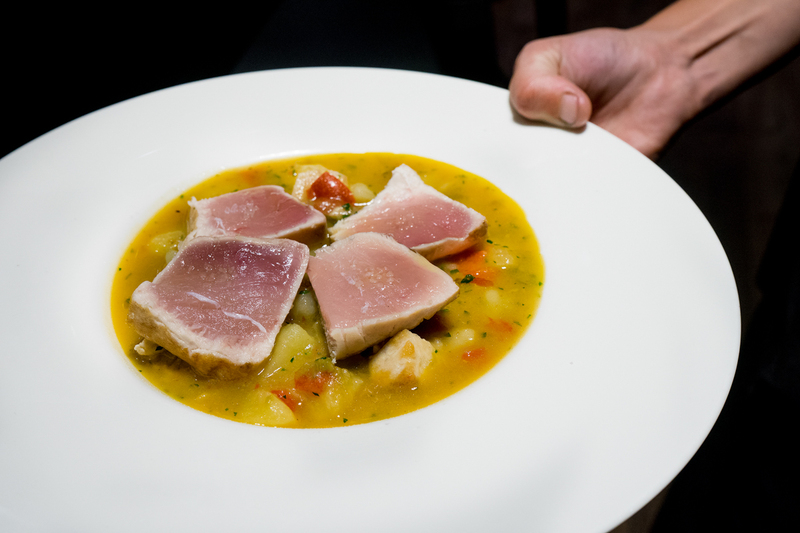 In some way, the recovery of this dish is a sincere tribute to the fishermen of the Basque Country. The result, an authentic culinary delight, accentuated by its marine personality, with a long history that hides every bite. On egin!